The 4-star Schiller 5 Hotel & Boardinghouse offers comfort and convenience whether you're on business or holiday in Munich. Featuring a complete list of amenities, guests will find their stay at the property a comfortable one. Free Wi-Fi in all rooms, daily housekeeping, taxi service, wheelchair accessible, kitchen are on the list of things guests can enjoy. Designed for comfort, selected guestrooms offer television LCD/plasma screen, internet access – wireless (complimentary), non smoking rooms, air conditioning, heating to ensure a restful night. The hotel offers various recreational opportunities. 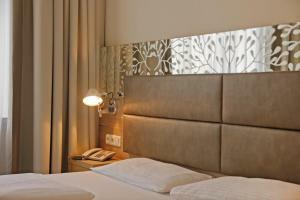 Schiller 5 Hotel & Boardinghouse is an excellent choice from which to explore Munich or to simply relax and rejuvenate.